From my position . . . on the way! The Uncooperative Blogger — Deployed! Evil Emperor Mindstation — Deployed! Six Meat Buffet — Deployed! Jim-Rose.com, The Libertarian Popinjay — Deployed! THE MUSLIM QUESTION — Deployed! Way Off Bass — Deployed! Psycmeistr's Ice Palace — Deployed! Chaotic Synaptic Activity — Deployed! Steve the Pirate — Deployed! Hillary Needs A Vacation — Deployed! Conservative Blog Therapy — Deployed! The Influence Peddler — Deployed! Code Red* Women for the Troops — Deployed! Right Wing Nation — Deployed! bRight & Early — Deployed! The Middle Ground — Deployed! 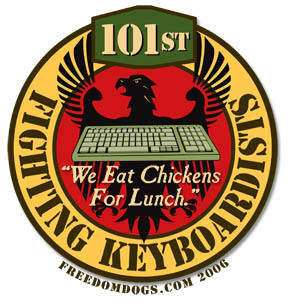 SingleMind.Net: Proud Member, 101st Fightin%u2019 Keyboardists! CaNN :: We started it. My online friends propose this link to use -[url=http://www.geocities.com/westlandus/top10.htm]TOP10[/url] – As for me, I think life is now!!! Excellent forum, added to favorites! The Good lad an author! I much like site! Useful tips for your personal finances. Coversey credit cards, personal loans, debt consolidation, and tips to improve your money habits. When the spirit moves me, I submit articles to the American Thinker, which the editor is always kind enough to publish. Here is the archive listing of those articles, in which I usually spell out themes at greater length than anything I put in a post here.